After studying luthiery and learning the trade from top builder Roger Giffin, Paul Herman then worked for many years with Pete and Wal, eventually taking over Wal production and re-launching the business from a new workshop in 2009. Having had his own brand of fine custom instruments, knowledge gained from Roger, Pete and Wal, together with his exceptional craftsmanship, has made the Wal bass what it is today. From the new workshop in Cobham, Surrey, Paul’s attention to detail and his never ending quest to continually refine and develop this iconic bass has moved Wal into a new era. “I am absolutely speechless with it, it’s flawless on every level, it’s better than I could even imagine, it’s a real credit that you can create something so beautiful and it sounds amazing too.” Daniel, New Zealand. “I am blown away at the craftsmanship on this instrument. Nothing else I’ve ever played feels or sounds as good as this bass. I really can’t thank you enough. I really think I will be a return customer at some point in the future. A fretless is already on my radar. Thank you again Paul, your service was really exceptional as well.” Ian, Seattle. “I always felt my basses to be the ‘mean’ through which I expressed what I musically felt, always into my comfort zone, while when I pick the Wal up I sort of feel like: ok, let’s see where are you taking me today. So, if I had to describe in one word my Wal I would choose INSPIRING, and I owe it to you. Thank you very much Paul for the bass and last but not least your kindness. It’s been a great pleasure to deal with you!” Marco, Rome. “The bass arrived today. Everything on it is fantastic. I love it! The weight of this 5 string is perfect! Looking forward to the silver bass next!” Mike, USA. “The Wal specifically is a great weapon for a bass player to stand behind. It has a very even tone and clarity, without adding too much attack on the front end, and a very well rounded low end that puts out what a bass player wants to hear without adding any muddiness. The signal is an easy one to re-produce live with a proper PA, and I enjoyed mixing it every night!” Beau Williams, F.O.H. sound engineer, USA. “I just wanted to thank you again for building me the most beautiful bass guitar I have ever seen. I absolutely love it, and the quality and sound is second to none. You are a true master of your craft. Thank you very much for building this amazing Mk3 for me!” Oliver, Switzerland. “I just want to say that it has exceeded my every expectation and I am thrilled with it. To be honest, I don’t think I can quite express how elated I am to now own two such works of art. Thank you for keeping the Wal brand alive, and crafting what are essentially the basses I’ve dreamed of owning since I was a teenager. It’s been a pleasure doing business with you and I wish you all the best in the future.” Jamie, California, USA. “Paul, the instrument is a jewel.” Francois, Canada. “Without doubt the best bass guitar I’ve ever heard, by a very wide margin.” Ott, sound engineer/producer, UK. “It is glorious. The colour is perfect, the craftsmanship is perfect and the tone is exactly what I wanted. I couldn’t have asked for better.” Rod, Florida. “Since the re-launch in 2009 we have seen a resurgence in this British beauty, and for good reason.” Bass Guitar Magazine. “It’s fantastic. Just fantastic. Whilst I own and have tried lots of high end basses I think I could say the Wal is possibly the greatest all round bass I’ve ever played.” Andy, UK. “Thank you for putting your heart into building such a beautiful instrument for me. Playing a Wal is a privilege and I feel very fortunate. I also appreciate you being a gentleman to work with throughout the process!” Jim, USA. Wal bass guitars first came onto the scene in 1976 when first-call session player John G. Perry asked Ian Waller (“Wal” to his friends) to build him a custom bass. This first bass looked and sounded unique and it was clear to both men that this was too good an instrument to keep to themselves. Wal and his business partner Pete Stevens then began a short run of Custom basses, the “JG” series (named after the owner of the first of these, John Gustafson) and its short-scale “JP” sister model (based on John G. Perry’s original). From the outset Wal talked to top-flight players and recording producers, involving them in the design process and in road and studio testing the evolving instruments. This was the Wal philosophy: to build the ultimate instrument, designed by professionals, for professionals. Virtually every component of the instrument was designed from the ground up. The heart of each bass was the revolutionary Wal pickup, which is unrivalled in the sheer range of detail and power it provides. 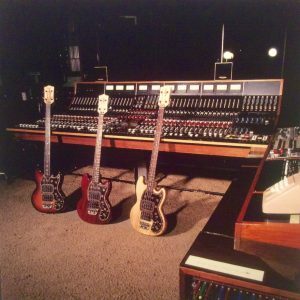 In 1978 Electric Wood Ltd. (based in High Wycombe) was formed and began production of the Wal ‘Pro’ Bass – the first production line instrument. Early versions featured passive pickups and controls, and a front mounted scratch-plate. A new active circuit was soon developed, and in 1980 the first 20 prototype Wal Custom basses were produced. Now known as the Mark 1 the electronics were designed to be ultra-quiet and housed in a shielded cavity in the back of the body. This new model was championed by many world-class players like Geddy Lee, Mick Karn and Paul McCartney. By the mid 1980’s musicians began to push the boundaries of the bass guitar, writing parts for sequencers and keyboards that travelled lower than the range available on standard 4-string basses. 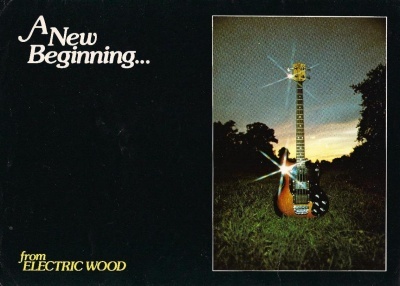 Electric Wood responded by developing their first 5-string bass. With its sleeker body-shape, the 5-string extended the range of the bass in both directions by introducing a 24-fret neck as well as the low B-string. 4-string versions of this adapted shape were soon commonly requested, and so the Mark 2 came to life. In July 1988 tragedy struck, when Wal died suddenly of a heart attack at the age of just 43. Although devastated by the loss of his long-time friend and partner, Pete continued production, ably assisted by his dedicated team, including Paul Herman. In 1994, prompted by the demands of players, work on the first 6-string bass began. Taking the opportunity to improve still further on the design of the body, the Mark 3 model came into life. 5 and 4-string versions were also introduced. Sadly after a long illness Pete died in 2011. His and Ian’s legacy continues to live on through Paul Herman and his team. 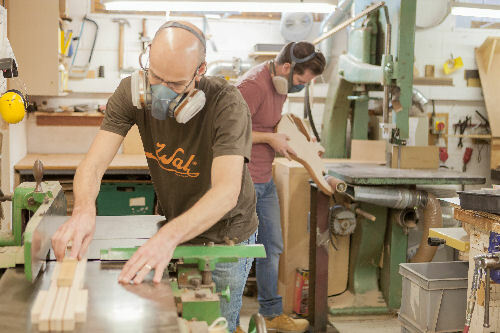 Now based in the Surrey hills the build-process and components that go into making a Wal bass remain unchanged, save for one or two subtle design improvements – an evolutionary process that has continued since the Wal bass began. 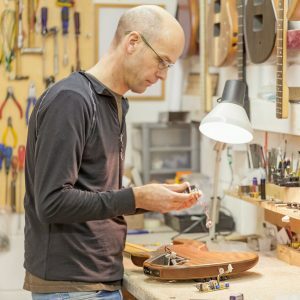 Each new instruments is built to the highest quality standard, using the finest materials and traditional hand crafting techniques, with one aim in mind – to produce the best made and finest playing instrument possible.